- [✔] Make Changes to "Glass Cannon"
SPAYmir is the father of the Frost Giants, and like all Norse Giants, he is evil. Grandfather to the All Father, Odin, Ymir lead his giant brethren into battle against the Gods. After ages of battling, Ymir was slain by Odin and his brothers, they forged the world from Ymir's remains. SPAThis Third person speaking Ice Giant is one of the original characters in Smite, he is also one of the few free characters that come with Smite. He has basic Crowd Control, a wall to trap the enemy (or troll your teammates), and a very powerful ult that if used right can do significant damage no matter the build. Ymir has the highest stats (except movement speed) when it comes to Guardians. Ymir is one of the few guardians that is able to take a lot of damage and return it back to the enemy with a nice little bow on it. If he is used right Ymir can be a key factor in any battle of the field. All of Ymir's abilities that affect enemies apply a Debuff to the enemy called Frostbite. All of Ymir's Basic Attacks against a target afflicted by Frostbite do 100% more damage. Enemies afflicted by Frostbite deal 10% less damage. Lasts for 4s. Ymir summons a wall of ice out of the ground that blocks player movement. Ymir smashes his club, doing damage to all enemies in front of him and Slowing them. Applies Frostbite. Ymir uses his breath to freeze enemies in blocks of ice, doing damage and Stunning them. Applies Frostbite. Ymir begins to freeze the air around him, causing shards of ice to grow on his back and Slowing enemies. 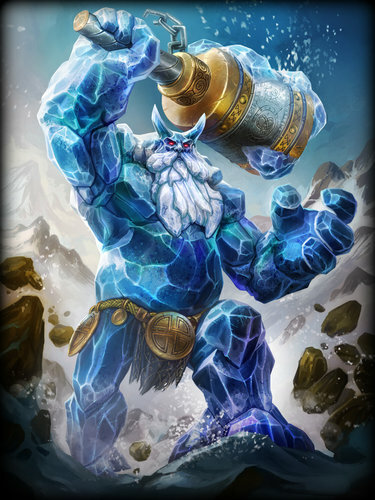 After a 3s channel, Ymir erupts out of his frozen state, causing shards of ice to do damage to all enemies in his range. Applies Frostbite. Cancelling the ability decreases the damage. The movement speed, that Shoes of Focus gives, will allow you to move faster, which is necessary on Ymir, the boots help Ymir stay in battles longer (with more mana) and deal more damage since abilities are not on Cooldown as much. [*] +18% movement speed (Ymir is crazy slow). Mystical Mail is a Warrior tank item (Yes, we're going to use it on a Guardian) that gives you physical protections as well as giving off an Aura that damages enemies over time. Pestilence gives off an Aura that gives the user Anti-heal and Anti-regeneration it also gives Magical protections as well as health. So as you're chasing the enemy damaging them with Mystical Mail, they can't regenerate their health as fast. These Items are mainly for Warriors, they allow the user to deal some damage while being tanky and denying the enemy team to heal as much. The combination of these items, Ymir's slows, stun, and his poke make him a force to be reckon with. The next item in the build is Void Stone, this Item gives an Aura that Reduces the Magical Protection of enemies while giving the user Magical Power and Magical Protection. Finally we've come to the end of this build and the last Item is the Ethereal Staff. Being the one of the two items that does not give off an Aura but instead a passive, Ethereal Staff feels like an item that was placed into the Game just for Ymir. The item gives Magical Power, Health, Mana, and converts some of your Health (Ymir having the highest base health in the game) into Magical Power. The movement speed, that Shoes of the Magi gives, will allow you to move faster, which is necessary on Ymir, the boots help Ymir do more early game damage (since we're going class cannon) and get through that early game armor. Warlock's Sash is a very powerful item. It stacks up to 100 (+3 Health and +.6 Magical Power per stack), so you buy it second. Don't buy it first because Ymir's movement is extremely slow if boots are not bought. Since we are going pure damage with this build, this item is almost required. The item increases your power immensely and making you very bulky. Ymir is also one of the few guardians with actual lane clear, so go get them stacks! Though Soul Reaver does give its user Mana, that is not the reason we are purchasing this item. The reason we really want this item is for the Large amount of Magical Power the item gives it's user. The item's Passive also allows you to deal more damage once every 40 seconds. [*] +When a god takes damage from your abilities, they take 10% of their maximum Health in additional damage. If multiple gods are hit, the damage is applied to the one with the greatest maximum Health. This can only occur once every 40 seconds. If you want a lot of Magical Power, Rod of Tahuti is where to go. Not only does the item itself give you a lot of Magical Power but its passive does as well. Now that we're at the end of the build, it looks like our Yeti has no Sustain. Polynomicon will do the trick! Not only does Polynomicon give Magical Power, Magical Lifesteal, and Mana It also gives the user the ability to combo their abilities with their basic attack, dealing +75% of your Magical Power after an enemy is effected by an ability. [*] +Using an ability gives your next Basic Attack within the next 8 seconds +75% of your Magical Power as additional Magical Damage. The effect can only apply once every 3 seconds. Both Sovereignty and Bulwark of Hope give the user Health and Protections, some more than others. But the reason I typically build Sovereignty first is because its Arua gives the user's Teammates +25 HP5. Sovereignty gives off the most HP5 in the game besides Stone of Gaia which also gives +25 HP5, but not to your Teammates. Though Bulwark of Hope doesn't Directly help your Teammates, it still helps them in the long run and it is still a great Tank item to have. Bulwark of Hope gives the user +20% CC Reduction, allowing Ymir to tank the CC and help set up kills for his Teammates. +20% CC Reduction makes Ymir a wreaking ball that no one wants to mess with. Bulwark of Hope's Passive gives the user more sustain and survivability, to soak up more damage and allow his Teammates to escape. When Ymir is below 30% health and takes Damage, he gains 150 Health and +10 for every level the player has for 20s. Since Bulwark of Hope and Sovereignty were situational items, that makes Breastplate of Valor and Heartward Amulet situational items as well. If you bought Sovereignty, with Physical Protections for your second item, then you would build Breastplate of Valor for your 4th item. If you built Bulwark of Hope, a Magical Protection item, for 2nd item in the build then you would need to buy Heartward Amulet as your 4th item instead. Both Breastplate of Valor and Heartward Amulet give Ymir Protections, Mana, and Health respectively but Breastplate of Valor gives its user Cooldown Reduction. Cooldown Reduction on Ymir is desperately needed because he main source of Crowd Control is Frost Breath which has an 18 second Cooldown with no Cooldown Reduction. Heartward Amulet gives Ymir's allies Magical Protections and +20 MP5, we are a Support Ymir so you have to have your Teammates in mind at all times. Though Ymir has a lot of sustain and HP5 with this build, we want more because some Enemy Teams are able to dish out more Damage than this build can handle. Stone of Gaia, even after the Removal of Magical Protections and the addition of +300 Health, this item is still viable. The main reason we want Stone of Gaia is because of it's passive, giving its user the ability to Regenerate Health very fast. In about 2 Minutes the User's Health with be fully Generated. [*] +Regenerates 2% of your max. Health every 5 seconds. There isn't much explaining I can do for this build, the only thing that comes to mind is care and love for your Teammates, the only reason they are going to stay alive and get kills is because of you. If you fail your job, your entire team suffers. The build can be used in any game-mode that requires a Tanky Guardian. SPAFor those of you who don't know, I am making this for a Ymir Guide competition. I've been meaning to make guides on this website for years but never got around to it. This competition finally gave me the motivation to do so, so if you liked the guide please share with your friends who can also learn how to play the Ice Giant himself! If you would like to see the information about the competition, click the picture above to view the details and join. Criticism is welcome! Good Luck in the contest. I am also competing in it, and if you'd like to peep the competition, check out my Ymir guide May the best content creator win! ChaoticUdders. Hilarious. It amazes me what names people can think of to represent themselves online. 112537 IceColdPappsi Good Luck in the contest. I am also competing in it, and if you'd like to peep the competition, check out [url=http://www.smitefire.com/smite/guide/frosty-the-snowman-ymir-for-dummies-guide-14765]my Ymir guide[/url] May the best content creator win! ChaoticUdders. Hilarious. It amazes me what names people can think of to represent themselves online. You even used my code! Looks very promising indeed, and I'm looking forward to seeing more from you. 112527 xZeroStrike Really cool! You even used my code! Looks very promising indeed, and I'm looking forward to seeing more from you. Yeah, I've seen it, thank you. 112532 xZeroStrike Yeah, I've seen it, thank you. It looks very promising so far; with the reasonable explanations and lots of visual upgrades- really looking forward to seeing this guide finished. Only thing I think might be worth mentioning is that you accidentally used the Warlock's Sash description in the "Strait Tank" spoiler (unless it's a placeholder, then my bad!). 112525 Daelinn It looks very promising so far; with the reasonable explanations and lots of visual upgrades- really looking forward to seeing this guide finished. Only thing I think might be worth mentioning is that you accidentally used the [[Warlock's Sash]] description in the "Strait Tank" spoiler (unless it's a placeholder, then my bad!). It's great that you have multiple builds and explain each one in detail. Thanks for taking the time to add a lot of bbcode too. 112510 ChaoticUdders Thank you for the support! In your Pros/Cons and Items sections, you use the [*] code, but you need to start it with "list" in brackets to make them true bullet points...and then don't forget to close it off with "/list". Interesting point of view, I never considered Mystical Mail to be a "warrior" tank item...the first person I think of when I think of that item is Ares. It's just such a damn expensive item (especially as item #2 in your first build) that I almost never get it on anyone. Just a comment. On your 2nd build, I know you're going full damage, but that said, have you considered replacing Ethereal Staff with one protection item? Sacrificing some health and mana (which you won't need with full stacks of Sash), but gaining higher effective health overall (at least potentially). At 3,000 health or so, the Staff passive is giving you pretty decent power (~75), but just something to consider testing out, unless it just completely defeats the purpose of it being a "glass cannon" build. One thing you might want to mention is if your 1st build is meant as an aggressive Support, or at least which mode(s) it's for...maybe you only use the Tank build as Support, but I don't know. Look forward to seeing this guide finished. 112488 Branmuffin17 Welcome, milkman. Comments as I go down the list...feel free to comment or absolutely ignore me =) In your Pros/Cons and Items sections, you use the [*] code, but you need to start it with "list" in brackets to make them true bullet points...and then don't forget to close it off with "/list". Interesting point of view, I never considered [[Mystical Mail]] to be a "warrior" tank item...the first person I think of when I think of that item is [[Ares]]. It's just such a damn expensive item (especially as item #2 in your first build) that I almost never get it on anyone. Just a comment. On your 2nd build, I know you're going full damage, but that said, have you considered replacing [[Ethereal Staff]] with one protection item? Sacrificing some health and mana (which you won't need with full stacks of Sash), but gaining higher effective health overall (at least potentially). At 3,000 health or so, the Staff passive is giving you pretty decent power (~75), but just something to consider testing out, unless it just completely defeats the purpose of it being a "glass cannon" build. One thing you might want to mention is if your 1st build is meant as an aggressive Support, or at least which mode(s) it's for...maybe you only use the Tank build as Support, but I don't know. Look forward to seeing this guide finished. Awesome, thanks for the explanations. Understood about Mystical Mail, and thanks for taking the time to explain. And yes, I did note that you indicated the 2nd build was not practical, and gave specific situations in which it would be fun to play, so my comment was just a thought on one slight adjustment to the build, which would increase survivability a bunch (perhaps) while not docking his damage by too much. In either case, it wasn't a complaint or anything, just something to think about. Anyway, will look for further updates! 112512 Branmuffin17 Hey Udderific, Awesome, thanks for the explanations. Understood about [[Mystical Mail]], and thanks for taking the time to explain. And yes, I did note that you indicated the 2nd build was not practical, and gave specific situations in which it would be fun to play, so my comment was just a thought on one slight adjustment to the build, which would increase survivability a bunch (perhaps) while not docking his damage by too much. In either case, it wasn't a complaint or anything, just something to think about. Anyway, will look for further updates!